Play outdoors. Grow environmental awareness. Use less stuff. Kaleidoscope of Trash RALEIGH — A new public art installation at one of the city’s garbage and recycling facilities encourages viewers to think about their role in minimizing waste in their communities. 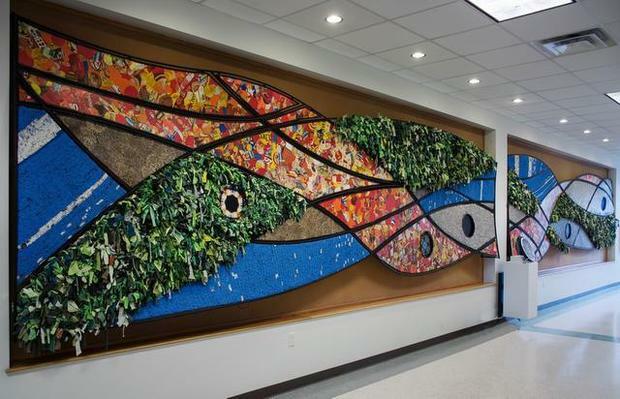 The colorful 8 feet by 40 feet relief wall inside the Wilders Grove Solid Waste Services Facility is made of layered recycled materials such as t-shirts, cereal boxes and plastic grocery bags and features interactive video kaleidoscopes that focus on the recycling process. The city will unveil the work at an open house on Jan. 25. The piece is the first of three works of public art officials expect will open in the city before late spring. Matt McConnell, one of three artists who helped lead the project, said the project was a great one, especially because of the level of community involvement. More than 200 volunteers helped collect materials and assemble during 1,200 hours of work. McConnell, who worked with artists William Lee Cherry and Marc Russo on the design and production, said he hopes the project allows viewers to consider carefully how their decisions affect the earth. “I hope that they can think about the way that they consume and how the waste that they create contributes to the environment,” he said. Baltimore's Inner Harbor is a city landmark teeming with tourists, restaurants and — until recently — floating trash. John Kellett used to walk by Pier 6 every day on his way to work at the Baltimore Maritime Museum on the Inner Harbor. He'd notice the trash floating in the water and hear tourists call the harbor disgusting — and it bugged him. That's when he developed his idea: a big water wheel to collect the plastic cups, cigarette butts and Cheetos bags that flow into the waterway after rainstorms. Kellett approached Baltimore officials about ways to remove the trash — and they listened. 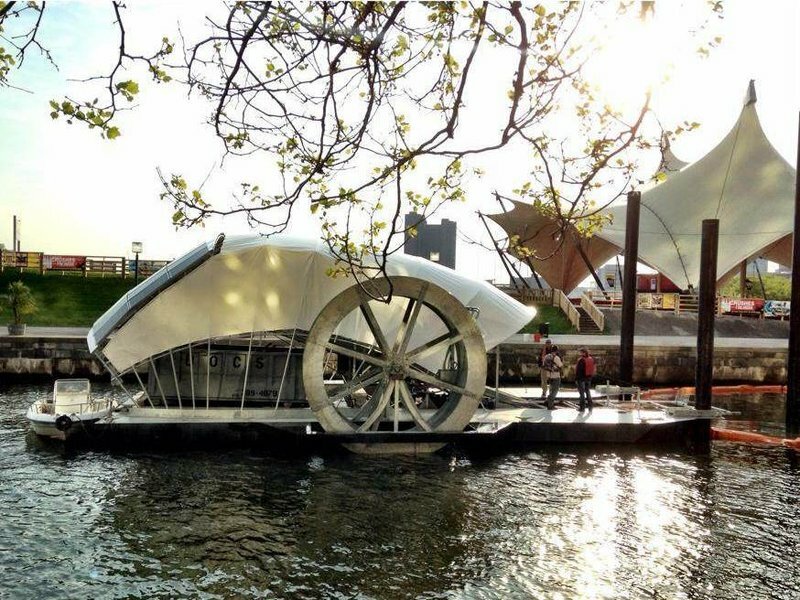 The water wheel is now docked in the harbor. "It looks sort of like a cross between a spaceship and a covered wagon and an old mill," says Kellett. "It's pretty unique in its look, but it's also doing a really good job getting this trash out of the water." "I started out thinking, 'Maybe we could bale it like a hay baler.' And then I said, 'Well, that's not necessary; maybe we can make it even simpler — we can just use the power of the runoff that brings it to collect it,' " he says. Kellett is talking about the runoff from the Jones Falls river. He placed the water wheel right where the river spills into the harbor. That's where trash lingering on Baltimore's streets ends up after rainstorms sweep it into storm drains. The city used to catch the trash with crab nets. But since the water wheel began churning in May, it has removed 40 tons of trash from the harbor. The dogs above are made out of old Wellington boots. It’s a long haul to move our cultures back to a culture of re-use from the present culture of single-use disposability. But moving in that direction may eventually lead us to what some have called the circle economy. Polystyrene pathways probably won’t lead to pristine beaches? 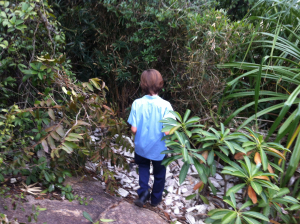 “Mum I found a secret way through the bushes to get to a rocky outcrop? All you have to do is follow the polystyrene path! He said this in such a matter of fact way . . . just follow the polystyrene path. As I scrambled through the buses following Finn on the path that really was mostly made up of decades old broken pieces of foam I tried to recall my secret hideouts as a child. Of course there was some litter . . . there were things that people threw carelessly out of car windows . . . but luckily I grew up just before this massive addition to plastic, especially bottles. So when we found a secret river it was not already littered with detritus that had blown or floated in mass quantities. What will Finn think of when he looks back on his childhood? Will he remember walking on beaches covered with trash? Or will things be so different in the future that a trashed beach will be an oddity?